Dr. Alden has dedicated his life to the war on liver cancer and pancreatic cancer. The NYC liver cancer surgeon & pancreatic cancer surgeon has performed well over 3500 surgeries in the past 15 years. At the forefront of medical innovation, he is a liver and cancer specialist who treats the most complex cancers using only the most advanced surgical procedures and technologies. Patients and medical professionals from America and around the world seek out his specialized best in class individualized surgery treatments and services including his expert surgical management of the patient’s unique condition. 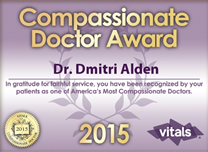 Dr. Dmitri Alden completed extensive training in hepatobiliary surgery and liver transplantation. He studied in Paris at the HepatoBiliary Center (CHB) at the Paul Brousse Hospital. Dr. Alden trained under Professor Henri Bismuth, considered by many the “founding father” of current liver surgery. In addition, Dr. Alden also dedicated 5 years to research in liver cancer and liver transplantation. Dr. Alden speaks fluent English, Russian, French, and German. Dr. Alden has subspecialized training and extensive experience in Robotic and Laparoscopic surgery and is considered one of the top surgeon’s using this contemporary method. Many of today’s common liver and pancreas procedures can be performed by Dr. Alden using laparoscopic or robotic techniques. In fact, the vast majority of our surgeries are done using the minimally invasive approach. Chances are, even if you were told elsewhere that minimally invasive surgery is not possible, we still might be able to offer you this option because of our extensive experience in the field. Dr. Alden was born in Moscow, Russia. He completed his medical school education at the Pirogov Medical Institute, currently Moscow State Medical University, one of the most prestigious medical schools of the former USSR. After completing a surgical residency in Moscow he moved to France. There he obtained diplomas in advanced surgical studies at the University of Nantes and University of Paris, the latter dedicated exclusively to liver surgery. Dr. Alden has been recognized as America’s Top 100 Surgeons (Consumers Research Council of America) for his achievements. 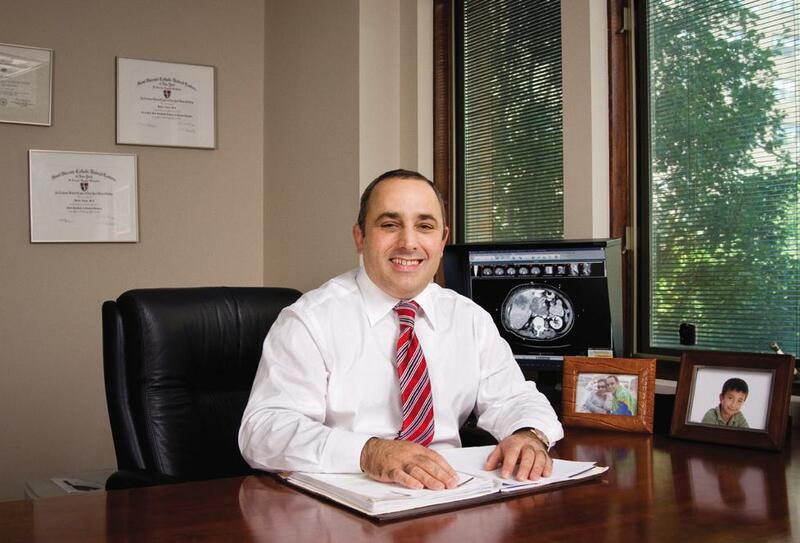 Dr. Alden is Board Certified by the American Board of Surgery, and was granted a prestigious fellowship by the American College of Surgeons (FACS). Dr. Alden is a member of several international surgical organizations. The author of multiple publications on liver and pancreatic surgery, Dr. Alden is a frequent speaker at international forums on the subject of liver, pancreatic, and robotic surgery. Dr. Dmitri Alden is a long time resident of Hudson Valley. For those who live in the Hudson Valley Dr. Alden and his team offer an option of local consultation and follow-up after surgery. The Hudson Valley office is conveniently located in Poughkeepsie, NY. This remote office brings New York City’s surgical opinion closer to your home, and allows you to avoid the stress and cost of long distance travel. In addition, some surgeries can be performed on the campus of Vassar Brothers Medical Center. Regardless of whether you decide to travel for surgery to Lenox Hill Hospital or choose to stay locally and be operated on at Vassar Borthers Hospital Dr. Alden will be performing your surgery. Dr. Alden has full surgical privileges at both institutions. If you are a Hudson Valley resident and would like more information please, contact Dr. Alden locally at: Tel. (845) 452-2120. 6. D. Alden, J. Guarrera, S. Emre, T. Fishbein, S. Guy, P.Sheiner, C. Miller, and M. Schwartz. Resection of cholangiocarcinoma involving the portal vein bifurcation. Surgery (submitted). 9. D. Alden, J. Kern, J. Guarrera, S. Emre, T. Fishbein, S.Guy, P.Sheiner, C. Miller and M. Schwartz. Biliary cystadenoma and cystadenocarcinoma: Surgical experience and anatomical findings. Accepted for publication in Journal of Gastroenterology. 1. D. Alden, G.V. Rodoman, N.Sh. Sultanov, A.A. Krupalov, New methods of treat¬ment and prevention of septic and post-operative complications. All Soviet Union Students Surgical Conference, Moscow, May 1990. 3. D. Alden, A. Hamy, F. Lerat, H. Gibaud, B. Savigny, J. Paineau, J. Visset. Percutaneous gallbladder drainage for acute cholecystitris in very old and critically ill patients. Annual West France Surgical Meeting, Nantes, March 1994. 4. S. Emre, D.Alden, J. Guarrera, T. Fishbein, S.Guy, M. Schwartz, P. Sheiner, and C. Miller. The Mount Sinai Hospital experience in split liver transplantation. The Annual AASLD meeting, Chicago, November 1996. 5. D.Alden, S. Emre, J. Guarrera, T. Fishbein, S.Guy, M. Schwartz, P.Sheiner, and C. Miller. The Mount Sinai Hospital experience in split liver transplantation. Meeting of the New York Transplantation Society, New York, October 1996. 6. S. Emre, D.Alden, J. Guarrera, T. Fishbein, S.Guy, M. Schwartz, P. Sheiner, and C. Miller. Donor age does not affect the graft outcome after liver transplantation. The Annual Meeting of the Middle Eastern Transplantation Society, Nicosia, Cyprus, October 1996. 7. M. Schwartz, S. Emre, D.Alden. The US experience in split liver trans¬plantation (first US survey). European Split Liver Congress, Brussels, May 1996. 8. S. Emre, A. Gurkan, D. Alden, J. Guarrera, T. Fishbein, S.Guy, M. Schwartz, P. Sheiner, and C. Miller. Use of small for size livers for transplantation. The Annual AASLD Meeting, Chicago, November 1997. 9. M. Schwartz, M. Sung, S. Emre, T. Fishbein, S. Guy, P.Sheiner, D. Likholatnikov, and C. Miller. Results of multimodality protocol for transplantation of patients with hepatocellular carcinoma > 5 cm. The Annual ASTS Meeting, Chicago, May 1997. 10. M. Schwartz, D. Alden, J. Guarrera, S. Emre, T. Fishbein, S.Guy, P.Sheiner, and C. Miller. Resection of cholangiocarcinoma involving portal vein bifurcation. The Annual Meeting of The American Hepato-Pancreato-Biliary Association (AHPBA), Miami, February 1997. 11. D. Alden, U. Sachdev, S. Emre, T. Fishbein, S. Guy, P.Sheiner, C. Miller, and M. Schwartz. Liver resection for metastatic ovarian cancer. IIIrd World Congress of International Hepatopancreatobiliary Association, Madrid (IHPBA), Spain, May 24-28 1998. 12. D. Alden, J. Guarrera, S. Emre, T. Fishbein, S.Guy, P.Sheiner, C. Miller, and M. Schwartz. Liver resection for hepatocellular carcinoma in patients over 70. IIIrd World Congress of International Hepato-Pancreato-Biliary Association, Madrid, Spain, May 24-28 1998. 18. M. Schwartz, D. Alden, J. Kern, J. Guarrera, S. Emre, T. Fishbein, S.Guy, P.Sheiner, and C. Miller. Biliary cystadenoma and cystadenocarcinoma: Surgical experience and anatomical findings. IIIrd World Congress of International Hepato-Pancreato-Biliary Association, Madrid, Spain, May 24-28 1998. 24. D.Alden. Use of laparoscopic ultrasound guided radiofrequency ablation in treatment of benign liver tumors. Presented at the AHPBA 2007. For more information on Liver, Bile Duct, or Pancreatic Treatment Options or Surgery (including liver transplants) or to make a private consultation please feel free to contact the NYC Liver, Pancreatic & Bile Duct Oncological Surgeon, Dmitri Alden, MD, FACS, today by phoning his New York office (212) 434-6216 or using the eForm on the right.